Yet, it has little to do with the billions of dollars pumped into cancer research year after year. The answer has been right in front of our faces for almost one hundred years (literally). It’s just not the answer that pharmaceutical companies are willing to accept. Pharmaceutical companies largely contribute to cancer research. They also hold a lot of control over much of the cancer research being conducted. So, they have vested interests in pharmaceutical solutions that are profitable. They don’t care much for solutions they can’t profit from. We all know that the standard pharmaceutical and medical treatment for hypothyroidism is ineffective. We all know that there are much better and more effective treatment options available. Well, the same goes for breast cancer as well. 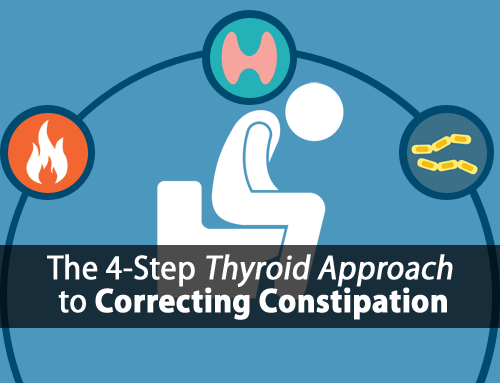 And this applies to thyroid sufferers more than anyone (especially those with Hashomoto’s thyroiditis). Some call the connection between hypothyroidism and breast cancer “controversial”. Yet, when you look at the studies that go beyond just comparing “diagnoses” the answer becomes much clearer. Numerous studies show lower levels of thyroid hormone (T3) in breast cancer patients, compared to controls. Studies also show a very high rate of anti-thyroid antibodies in breast cancer patients, which is why those with Hashimoto’s thyroiditis are at an even greater risk. But, the bigger connection (and cause of most breast cancer) is found by looking at estrogen and progesterone. In the past, I’ve written in detail about how hypothyroidism causes estrogen dominance and progesterone deficiency. I’ve also shown how Hashimoto’s thyroiditis develops due to long-term estrogen dominance when hypothyroidism is improperly treated. According to Dr. Raymond Peat, studies showing estrogen’s cancer-causing effects and progesterone’s anti-cancer effects date back to the 1930’s. Today, there’s so much evidence showing estrogen’s involvement in breast cancer and tumor growth that it’s now accepted without question. Needless to say, the risk of breast cancer among hypothyroidism and Hashimoto’s sufferers is not only real… it’s frightening. 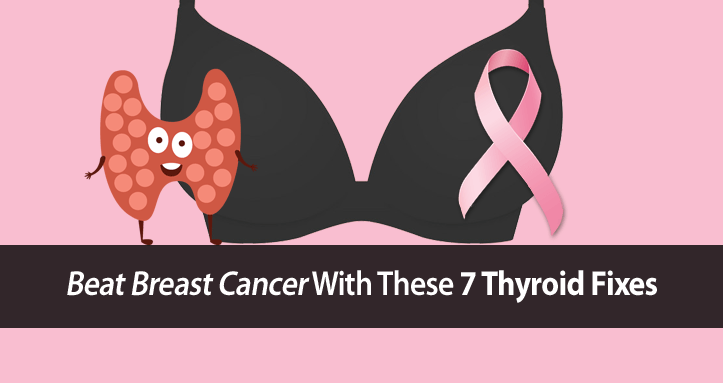 So, let’s look at seven ways to gain the upper-hand on hypothyroidism and breast cancer. While each of these plays a role in helping to beat existing breast cancer, I highly recommend you use the first six, which will also help to prevent it from occurring. Of course, prevention is always the best way to beat any disease. The last one mentioned here has been shown to be very effective against breast cancer, but more research is still needed. For decades, progesterone has been shown to be extremely effective against breast cancer. The controversy behind its use has been due to the pharmaceutical industry’s insistence on the use of their patented synthetic progestins in breast cancer research, instead of real bio-identical progesterone. Synthetic progestins don’t act the same way as bio-identical progesterone, and they’ve been shown to increase cancer risk. Bio-Identical progesterone has been shown to be the ultimate weapon against breast cancer. In the absence of adequate progesterone, estrogen receptors turn on the “genes” that cause breast cancer to grow and metastasize (spread). Supplementing progesterone reprograms the breast cancer’s estrogen receptors. Supplementing progesterone helps significantly shrinks breast cancer tumor size. In other words, supplementing progesterone not only protects and prevents breast cancer, but it also helps shrink existing breast cancer tumors. 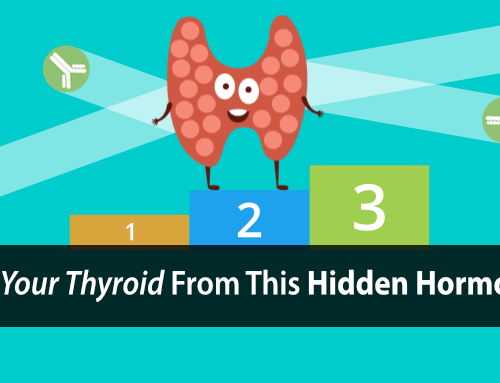 Thyroid hormone (T3) works positively with progesterone in a number of ways. For starters, it helps increase natural progesterone production. But it also helps by inhibiting the aromatase enzyme, which can chronically overproduce estrogen within your fat cells. 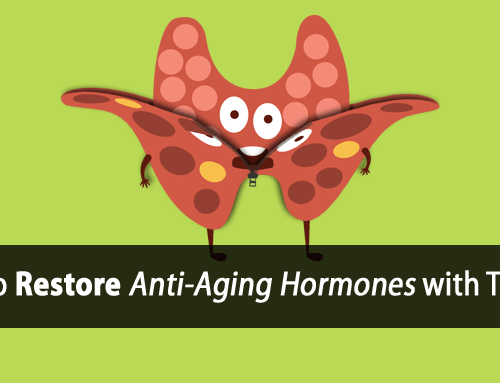 Increased aromatase is commonly found in hypothyroidism and increases with age. It has also long been associated with breast cancer. Aromatase inhibitors are often prescribed to breast cancer patients, to help prevent the recurrence of the cancer. Thyroid hormone (T3) and progesterone both inhibit aromatase as well and can provide the same preventative effects. I use both with my clients, which you can find on our page of Thyroid Supplements. Breast cancer itself is scary enough. But the way it kills you is through the spreading of the cancer throughout your body. Niacinamide has been shown to not only prevent the metastasis (spreading) of breast cancer, but to also increase survival once the spreading has occurred. It also provides a number of therapeutic benefits for hypothyroidism sufferers, which is why we use it in our Vitamin B Thyroid Complex. You know that little bottle of aspirin tucked in the back of most peoples’ medicine cabinets? Did you ever think that something so simple could end up being the cure for cancer? Well, it also has anti-estrogenic and metabolic-supportive effects that can help improve thyroid function too. Blocks breast cancer tumor growth. Prevents breast cancer metastasis (spreading). Reprograms breast cancer cells back to normal healthy cells. These effects have been shown with the equivalent of a single 325 mg aspirin daily, which is amazing if you ask me. A new human study that’s currently underway is showing even more promising effects of aspirin on breast cancer. Significantly prevents breast cancer occurrence. Effectively stops breast cancer growth in 80% of patients. Helps prevent breast cancer relapse/reoccurrence by inhibiting the production of cancer stem cells resulting from chemotherapy. Helps save terminal breast cancer patients by increasing the cancer’s response to chemotherapy, when chemotherapy would normally be ineffective. In hypothyroidism, estrogen builds up within your body because your liver can’t detoxify it. To detoxify estrogen properly, you depend on your glucuronidation detoxification pathway. Supporting this essential detoxification pathway requires adequate dietary protein and carbohydrates together. A minimum of 70 to 100 grams of high quality protein (not plant based) is required, along with even more carbohydrate. When your liver can’t detoxify estrogen, as described above, your body excretes it into your bile in an attempt to flush it out through your digestive tract. The only problem is that estrogen is often easily re-absorbed within the digestive tract and never leaves the body. Raw carrot fiber is one the safest sources of fiber that can help absorb the estrogen within your digestive tract and prevent its re-absorption. PUFAs, or polyunsaturated fats, are well known to suppress your thyroid on all levels. But a diet high in PUFAs has been shown to increase breast cancer rates as well, likely due to the estrogenic effects of these unsaturated fats. In other words, PUFAs are known to synergize with estrogen, amplifying its activity and harmful effects. So, avoiding PUFAs and replacing them with saturated fats in your diet can help protect you against breast cancer. Free fatty acids: a possible regulator of the available oestradiol fractions in plasma. I don’t talk much of healing herbs, mostly because there’s often a lack of research, and the mechanisms of their actions are not very well understood. So, it’s difficult to recommend something without knowing how or why it might (or might not) work. Artemesinin, extracted from Sweet Wormwood, may be an exception to the rule. It was first developed in China where it was proved as an effective treatment for malaria. Yet, it was more recently discovered to also have potent anti-cancer effects, which has spawned more research into understanding its actions. Cancer cells take up large amounts of iron, which is necessary for it to grow and multiply (yet another reason to be careful with supplementing iron). Artemesinin, being attracted to iron, bonds to cancer cells and reacts with the iron to kill the cancer cells. Research thus far has shown that it is extremely effective at killing breast cancer cells (among other forms of cancer) without harming healthy non-cancerous cells. The problem with radiation and chemotherapy cancer treatments is that they are toxic and harm all cells, both cancer and healthy ones. So, it could prove to be a truly safe and effective chemotherapy agent, but more research is still needed. We may not be winning the “war” on breast cancer, but that doesn’t mean that you don’t have effective options. As evidence continues to mount, how long can progesterone (and other options) continue to be ignored as an effective breast cancer treatment? Seeing as how cancer research has ignored it for almost a hundred years, I don’t see any reason why that would change anytime soon. Sometimes we have no other option but to take control of our own health. But as you can see, there are many simple ways to improve your thyroid health, which can also help prevent cancer. I have seen two recent post regarding the bio-identical prog. Do you recommend that the patient be tested before using this to see if it’s needed, or would a small dose be beneficial regardless? Hi Laurie, testing isn’t necessary and I don’t typically test my clients unless necessary. In cases of severe estrogen dominance, it’s important to supplement larger dosages to prevent any potential conversion to estrogen. Hi Mari, I cannot recommend you make any changes to your prescription medication. I will say that those of my clients who have used different sources, including prescriptions, prefer the progesterone oil. Does your bio-identical progesterone product contain anything from swine? Hi John, no it does not. I have had BC, do you still recommend taking bio-identical hormones and if so, I am 67 years old, is that too old to take hormones? Bio-identical progesterone, yes. Never estrogen as it only increases risk of breast cancer, among other health complications. You’re not too old to use. 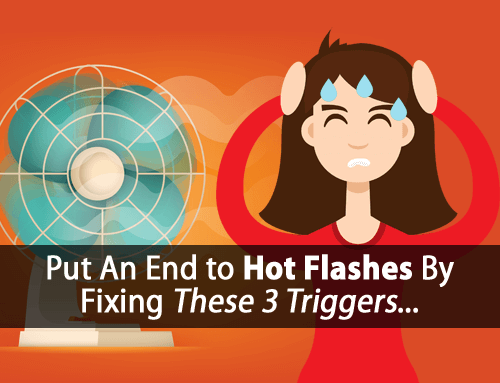 It can still be very important post-menopause. Can you use your progesterone oil on your skin or only orally? Hi Beth, it depends on the purpose you’re using it for, but yes. I often will use it with clients with RA rubbed into the affected joints. For general use, I wouldn’t recommend applying it to the skin. 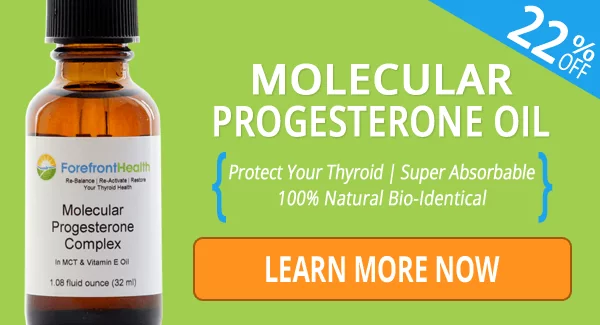 I was diagnosed with hypothyroidism six years ago, and I take NDT and I am thinking of using progesterone to aid my adrenals. I had breast cancer 22 years ago and went through an early menopause because of the treatment I had. My concern is, could the progesterone turn into oestrogen and cause me any problems. Hi Elaine, studies consistently show that progesterone is protective against estrogen and breast cancer, so I don’t believe that is a legitimate concern. Regarding the iron issue and cancer; what is your opinion of using IP-6 to keep iron levels at bay, I know it is phytic acid and is an anti-nutrient when consumed with other foods or supplements, but the research and benefits seem to be good vis a vis the iron level controling and with anti-cancer protocols when used on an empty stomach? If not that, do you feel that lactoferrin is a good supplement to use as a replacement? Some websites say that hypothyroid people are ‘low’ in iron, so it makes me wonder if any of the aforementioned would/should be used if one is hypothyroid. I think that iron can be fairly easily self regulated through diet/phlebotomy (if needed) that it shouldn’t require the need for questionable supplements. This is also discussed in the article mentioned above. Does taking progesterone cause weight gain? Progesterone itself doesn’t cause weight gain. However, depending on the underlying dysfunction and hormonal imbalances weight can fluctuate anytime we alter hormonal status. Progesterone receptor in non-small cell lung cancer–a potent prognostic factor and possible target for endocrine therapy. Can I use apple cider vinegar in the carrot salad in place of white vinegar? You can, but you have to be very careful because apple cider vinegar is made from apple cider, which often is made with carrageenan. Because it’s not added to the end product it’s not listed in the ingredients. Do you know it the organic apple cider vinegar contains carrageenan? Such as the Bragg Organic, Raw -Unfiltered Apple Cider Vinegar . Hi Tom, I am 62 , I do have a lot of body aches and do not sleep well. Should the levels of progesterone be check via lab before using the oil? Hi, Meat/dairy/soy/BPA/chemicals/fat/The Pill may make someone estrogen dominant. At premenopause when progesterone goes down that helps the immune system cancer may start. Cancer people may be Celiac which affects hormones/thyroid/the liver and gluten may lower nutrients absorbed in the intestines and lowers the immune system. No gluten/dairy/soy/sugar/GMO/food with a label..taking vitamins/good oils/minerals…probiotic…LDN..detoxing. Bioidentical hormones/natural thyroid medicine/Zn/Fish oil/Vit C/Mg/coenzymated B vitamins/eating organic/good water/exercise/Nature’s plus- Source of life multiple/Essiac/mushrooms/Vit D3/sunlight/low stress/juicing and more help me. Gluten is wheat/barley/rye..oats/corn rice. LDN helps block hidden gluten. Gluten may be the number one reason thyroid is low. Low oxygen in cells may cause cancer. Soy etc may block the thyroid. Iodine may help with Se. Zn/Se/enough iron/probiotic may help T4 convert to T3 for thyroid hormone to work. Hair tests help see good minerals levels heavy metals. Sweating may help detox heavy metals fast…then sea salt/good minerals may help since detoxing also removes good things. Heavy metals may block thyroid. Genova test is for vitamins/allergies/hormones. Zyto scan shows infections/how organs and glands are working. Herbs/strong probiotic/Far Infrared Sauna and ozone may help infections. Antibiotics may hurt the gut lining/hurt mitochondria/wipe out good bacteria in the large intestines/lower Mg/lower the immune system. Mitochondria being hurt by heavy metals/chemicals/antibiotics may cause a person to need a higher thyroid dose not by blood tests. Don’t trust blood tests. Hurt mitochondria may cause low oxygen/cancer. Progesterone may make estrogen receptor sites more sensitive. but progesterone helps blood sugar which may feed cancer/blood pressure/help the immune system/help thyroid/help relax/help sleep/help energy/balance hormones. I take estriol/progesterone/testosterone. I need all 3 so ratios are right for my brain/body. Bioidentical hormones are awesome help. I am only on this earth due to them. People may figure out a herbal way to help hormones also.